Kidney-sparing surgery is increasingly being used instead of radical nephrectomy in select patients to treat localized small renal tumor masses. Knowing the location of a cancerous tumor within the kidney and its anatomic relation to other surrounding structures is an important factor when making this surgical planning decision. A 3D model of a malignant renal mass created from MRI images. Courtesy of Nicole Wade, NYUMC. Urological surgeons currently use 2D, 3D and 3D reformatted images to assess kidney tumor anatomy. 3D printed models derived from MR images show potential to also aid in pre-surgical planning decisions of complex kidney cancer, according to an article published in Abdominal Radiology. 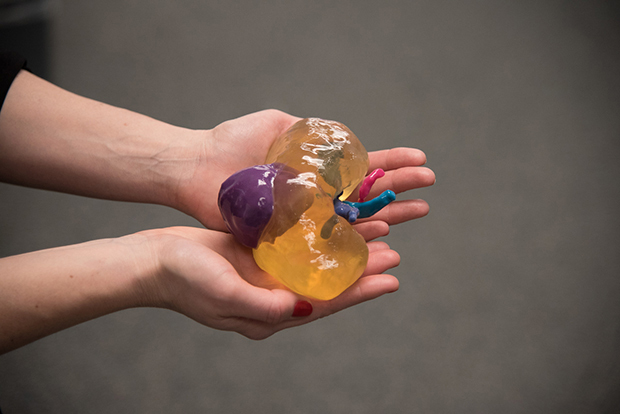 A proof-of-concept study conducted at New York University School of Medicine evaluating the benefit of creating 3D printed models of kidney anatomy showed that surgical planning was changed for all cases evaluated when a 3D printed model was available. The multi-specialty team of radiologists and urological surgeons retrospectively compared MRI images and 3D printed models of 10 cases. These cases were selected from a registry of 74 patients who received clinically indicated and research MRI prior to surgery for renal masses and had Nephrology Scores greater than 6. The 3D-printed models were generated from a 3D postcontrast, fat-suppressed, gradient-echo T1-weighted sequence with an interpolated spatial resolution of 1.4 mm x 1.4 mm x 2 mm. The MR images were post-processed to segment the kidney tumor, kidney cortex and medulla, main renal artery, main renal vein, and ureter as five separate regions of interest (ROIs). To ensure that only the anatomy of interest was selected, both thresholding and manual editing were performed. Each ROI was converted to a separate 3D object and combined into a 3D virtual model. Image post-processing time for each model took approximately 7 hours and an additional 10 hours to print at a cost of $1,000. The kidney components were printed in a translucent material and the surrounding structures were printed in various colors so that the surgeons could easily visualize the location and size of the tumor as well as the relationship of the tumor to key anatomical structures such as the renal artery and renal vein. Being able to hold these anatomically accurate models in their hands allowed the surgeons to immediately grasp the disease and determine a surgical plan. For the study, three urological surgeons who had extensive experience performing pre-operative planning using 3D multi-planar reformatting capability independently reviewed the MRI images on PACS. At least one week later, they reviewed the cases again using MRI images and a 3D model derived from them. For each session, they were asked to complete a questionnaire relating to surgical planning decisions they were making for each case. Each set of responses was compared, as well as the clinical notes describing the actual surgical intervention of the nine cases where surgery was performed at NYU Langone Medical Center in Manhattan. With the addition of the 3D models, lead author Nicole Wake, a doctoral candidate in biomedical imaging, and colleagues reported that the most frequent changes in pre-surgical planning related to the transperitoneal or retroperitoneal approach and clamping. Compared to surgical planning using only MRI images, one surgeon would have changed the transperitoneal or retroperitoneal approach in 4 cases and the two others in 3 cases with the addition of the 3D model. For clamping approaches, changes were made in 5 cases by one surgeon and four cases by two. Concordance between the actual surgical approach and pre-operative surgical decisions regarding nephrectomy type, laparoscopic or open approach and clamping all improved with the use of the 3D models. In cases of complex surgeries that resulted in an actual parenchymal volume loss of more than 20%, the surgeons altered their planning approach more often when a 3D model was available. “It is possible that 3D printed models may facilitate better anticipation of patient-specific anatomy and better planning for a complex surgery, potentially allowing for fewer changes to be made in the operating room. This could reduce the duration of induced ischemia or complications related to complex tumor anatomy,” wrote the authors. Acknowledging the expense of creating these models, they suggest that its use may be most appropriate for surgical planning of complex renal masses. The authors also reported that more features are needed for the models. More internal anatomy, such as distal arterial branches and renal calyces are needed to enable surgeons to determine if anything is directly feeding a tumor and whether or not to anticipate collecting system repair. Determination of the proximity of the tumor to the vasculature should also be improved to facilitate planned vessel clamping and functional outcomes. Wake N, Rude T, Kang SK, Stifelman MD, et al. 3D printed renal cancer models derived from MRI data: application in pre-surgical planning. Abdom Radiol. Published online January 7, 2017. 3D MRI-derived models aid surgical planning for complex kidney cancer surgery. Appl Radiol.